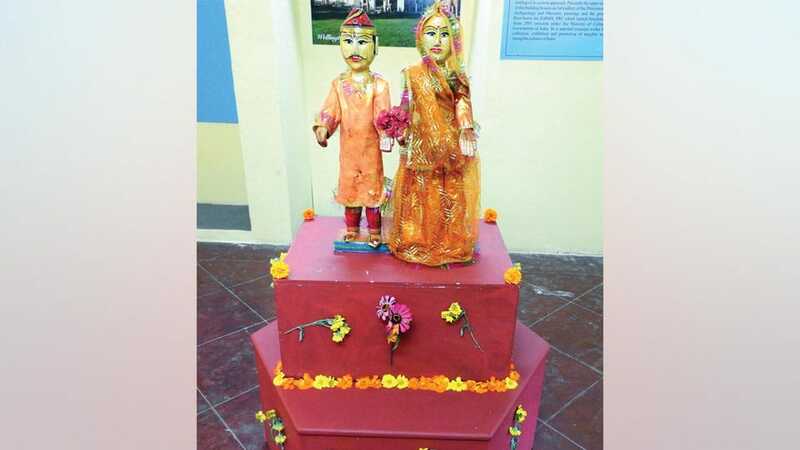 In continuation of its popular museum series ‘Exhibit of the Month,’ Indira Gandhi Rashtriya Manav Sangrahalaya (IGRMS), Southern Regional Centre (SRC), Mysuru, has kept on display Gangaur (images of Eshwar Ji and Gauri Ji), a Folk object from Udaipur, Rajasthan. The object was inaugurated at Wellington House on Irwin Road in city by the Officer-In- Charge, J. Vijay Mohan on Sept.6. The exhibit will be on show throughout the month of September 2018. The festival celebrations occur almost round the year in Rajasthan. Gangaur is a largely female-centric festival and most of the festivities, the pujas are conducted by women. It is celebrated in honour of Gauri, the Goddess of abundance. Young girls adorned in their best clothes pray for a spouse of their choice. The married ladies pray for the welfare of their husbands. The celebrations at Bikaner, Jodhpur, Nathdwara and Jaisalmer are full of pomp and are a must-see. Girls worship the Goddess throughout the preceding fortnight. Colourful images of Gauri are taken out in procession accompanied by the town band. The festival commences on the first day of Chaitra, the day following Holi and continues for 16 days. Festivity consummates on 3rd day of Shukla Paksha of Chaitra Month. Fairs (Gangaur Melas) are held throughout the 18-day period. The festival reaches its climax during the last three days. The images of Gauri and Isar are dressed in new garments especially made for the occasion. Unmarried girls and married women decorate the images and make them look like living figures. At an auspicious hour in the afternoon, a procession is taken out with the images of Isar and Gauri, placed on the heads of married women. Songs are sung about the departure of Gauri to her husband’s house. The women bid farewell to Gauri and turn their eyes and the Gangaur festival comes to an end.